The D D Kosambi Festival of Ideas is scheduled to launch its 12th edition from January 20 to 23, 2019 at Kala Academy Goa, Panjim. This year, the festival will feature noteworthy resource people like Malaika Vaz, Dr Mickey Meta, Pralhad Kakar and Swami Smaranananda Giri. Festival of Ideas is a popular festival held yearly, featuring eminent guests as speakers. Damodar Dharmananda Kosambi (1907–1966) has been an inspiration to many across the world, especially to Sanskrit philologists and Marxist scholars. The Government of Goa instituted the annual D D Kosambi Festival of Ideas in February 2008 to commemorate his birth centenary. 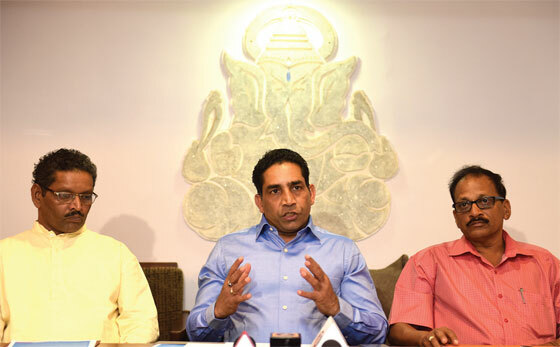 Govind Gaude, Minister of Art and Culture, states, “The basic idea behind organising this festival is to induce the growth of knowledge, educationally and generally.” The organisers have keenly picked out personalities to enrich the participants. Malaika Vaz is a 21-year-old youth, a National Geographic explorer, adventurer and wildlife presenter. On the first day of the event, she will enlighten the public on her passion for adventure sports and environment. She will also speak on conservation and the popularisation of science. The second day will feature Dr Mickey Mehta, a leading global holistic health guru and a corporate life coach. He has life-coached billionaires, politicians, Bollywood stars, Miss Worlds and Miss Universes. He will share light on the topic ‘From Harlem to Harvard’. Pralhd Kakar, chairman and Founder of the Prahlad Kakar School of Branding and Entrepreneurship, will take the audience on a journey from ‘Goa-Yesterday, Today, and Tomorrow’. He is also the Advertising Film Director for Genesis Films. On the last day of the event, Swami Smaranananda Giri, the Vice President of Yogod Satsang Society of India, will speak on topic ‘Leading a Balanced and Joyous life Through Yoga- Meditation’. He has previously conducted a number of talks and interactive sessions throughout India and abroad. The Festival of Ideas will be providing DVDs of the previous D D Kosambi event talks delivered by the speakers, at the venue. There will also be live broadcasts of the lectures on the Directorate of Art and Culture website.